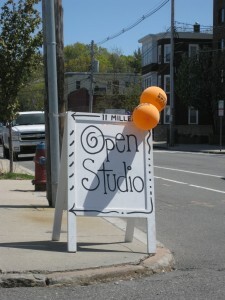 Seeing all the open studio signs last week in Somerville reminded me that it’s high time to update the 2013 calendar of open studios in Massachusetts. Not to worry if you missed last weekend’s event. There are more than two dozen upcoming open studio events listed on the calendar including Cambridge this coming weekend. Open studios are a great opportunity to meet your neighbors, find something special for your place or for a friend, and a super way to support the local arts community. Check out the calendar and if your event isn’t listed please get in touch. This entry was posted on Tuesday, May 7th, 2013 at 10:32 pm	and is filed under Area Events. You can follow any responses to this entry through the RSS 2.0 feed. You can leave a response, or trackback from your own site.